Two weeks ago I was lucky to be invited to participate in a Nuffnang Lovin’ event – Nuffnang Lovin’ Christmas Countdown Part 2: Christmas Party Snacks with Ayam Brand. 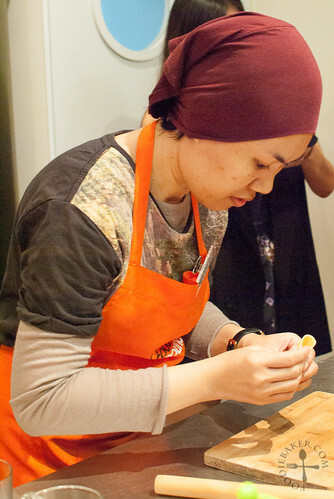 It was a delicious hands-on event in which we learnt 3 dishes using Ayam Brand products. Ayam Brand is definitely familiar to most Singaporeans – we see its products in every supermarkets and mini marts. My favourite is the tuna range of products! The tuna mayonnaise is a great sandwich spread; the tuna flakes in water/oil can be used in pasta; and my mom uses the curry tuna as a pizza base, yum! Do you know that Ayam Brand is founded by a French, Alfred Clouet? All along I thought it’s founded by a Singaporean, because of the word “Ayam”, which means “chicken” in Malay. 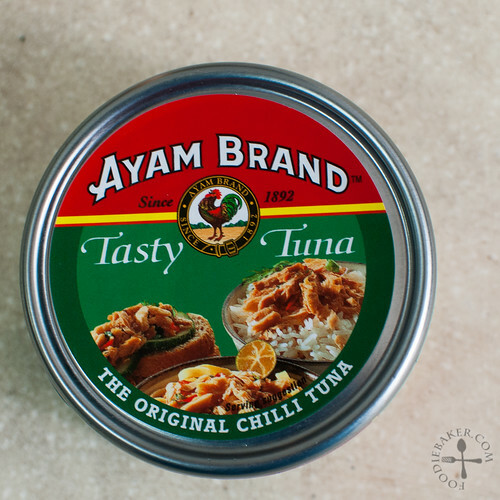 Ayam Brand was started in 1892, with the first import being sardines in 1899. Canned food is a new technology then, hence it is highly regarded, even winning a gold medal at the Universal Exposition in Paris in 1900. Ayam Brand products are now available in 30 countries including Australia, Canada, USA, and Europe. Some photos that I’ve taken during the event. See the full album of photos here on Facebook! 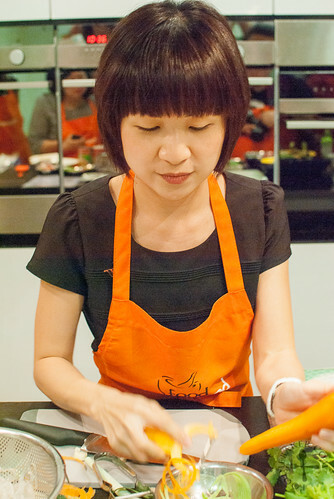 The event was hosted in Food Playground, a locally established cooking school. 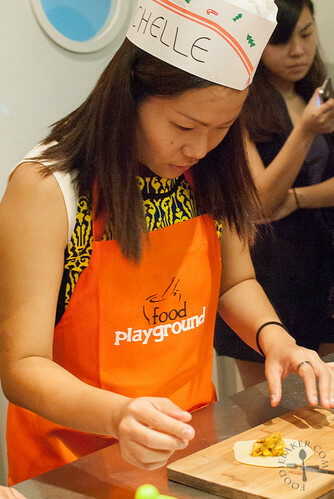 The cooking instructors in Food Playground are not professional chefs, but homegrown passionate foodies who love to cook for their family and friends. One thing that I learnt and admire about Food Playground is that they hire only stay-at-home mothers and active seniors to re-engage and integrate them back into society. The Christmas platter that my team did! 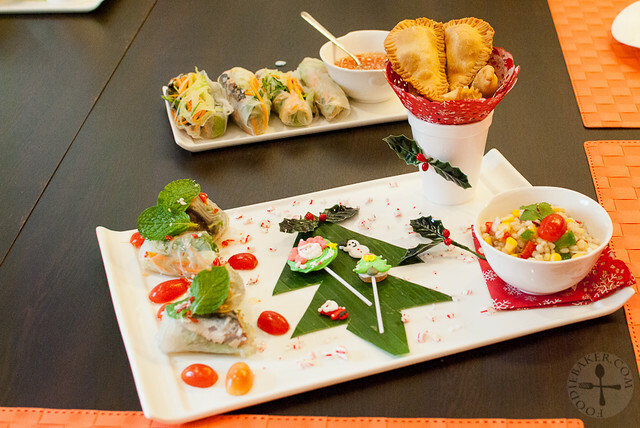 We were split into 4 teams and after watching the demonstration by the cooking instructors, we whip up the dishes ourselves and we had a mini competition to see which team can decorate the Christmas platter the best. Our team didn’t leave with any prize in the end, but we did leave with a full stomach of curry puffs, Vietnamese spring rolls and barley salad. The tiny curry puffs are so addictive that I cannot stop eating them after the event, I think I ate about 4 or 5… oops! 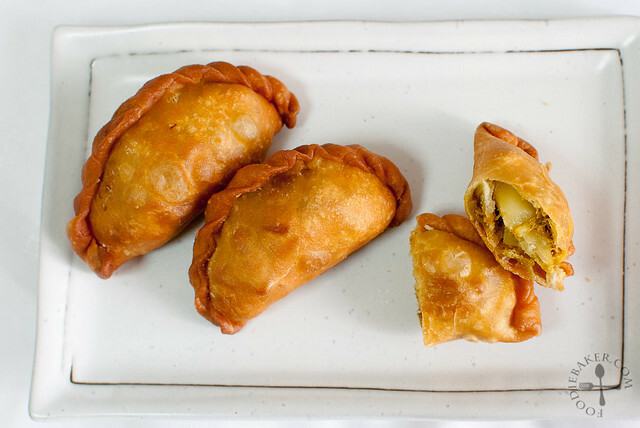 I love how the skin is thinner than the usual curry puffs so it’s not as doughy and the filling is made with a combination of Ayam Brand chilli tuna and potatoes – not the authentic filling but still very delicious! 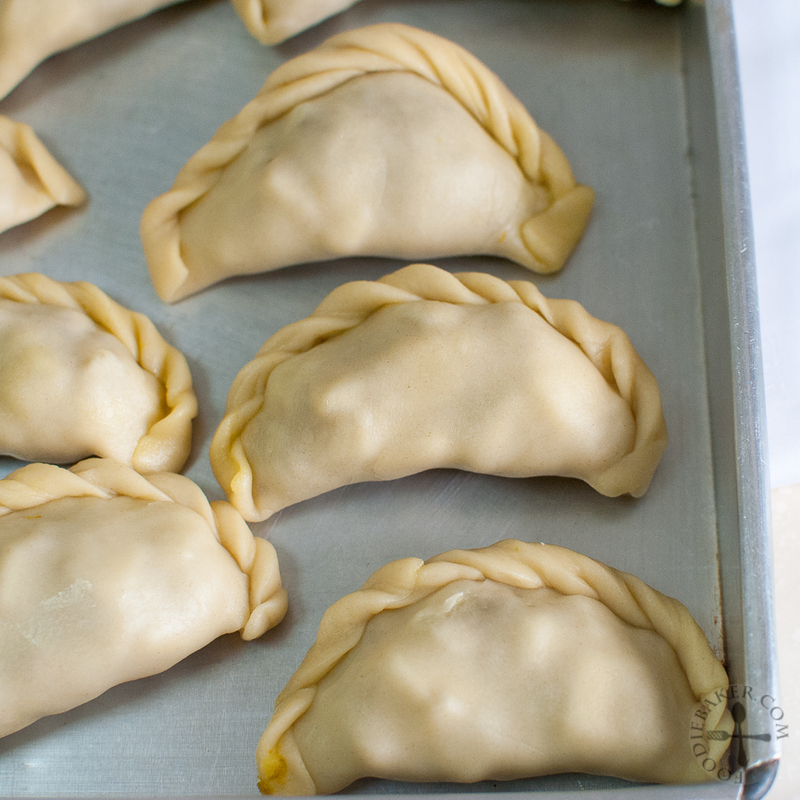 When I was making them in class, I couldn’t crimp the curry puff edges properly and I was pretty bothered by that – I thought about them so much that I decided to try it again at home. After watching a few YouTube videos, I finally got the hang of it and managed to crimp some pretty good-looking ones (self-praising here… haha!) I had X to take a video using my phone which I will attached at the end, I hope it will be useful! 1) Dice the potato. 2) Cover the potato with water. 3) Season with salt. 4) Boil till tender and drain. 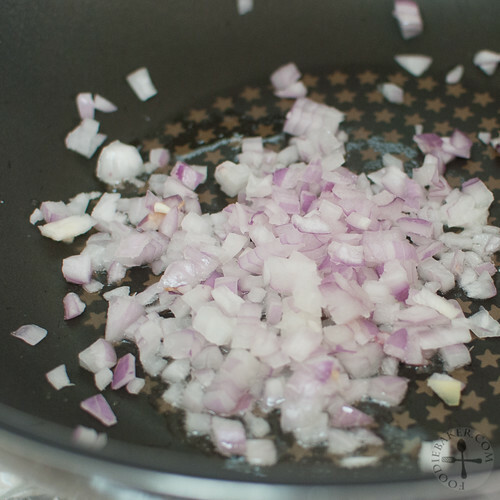 5) Dice an onion finely. 6) Sauté in a little oil until translucent. 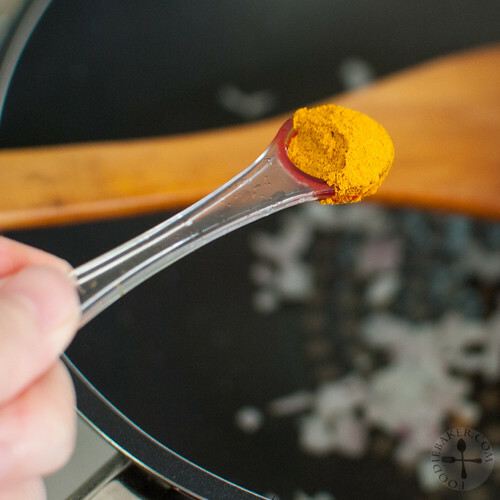 7) Add in turmeric and continue to sauté the mixture. 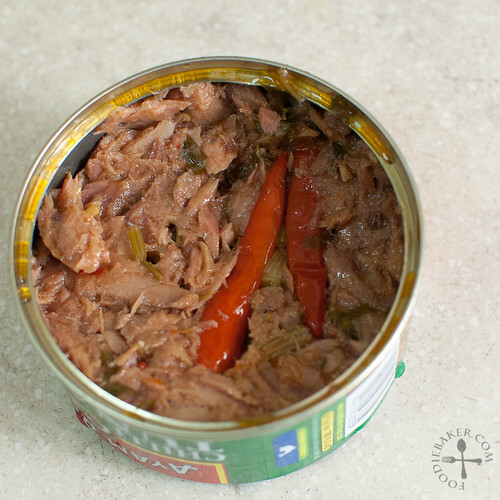 8) Open a can of Ayam Brand chilli tuna. 9) Drain and discard the chillis. 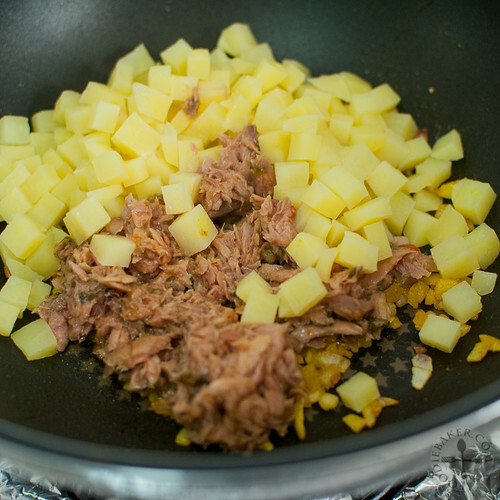 10) Add potato and tuna and stir-fry. 11) Set aside to cool completely. 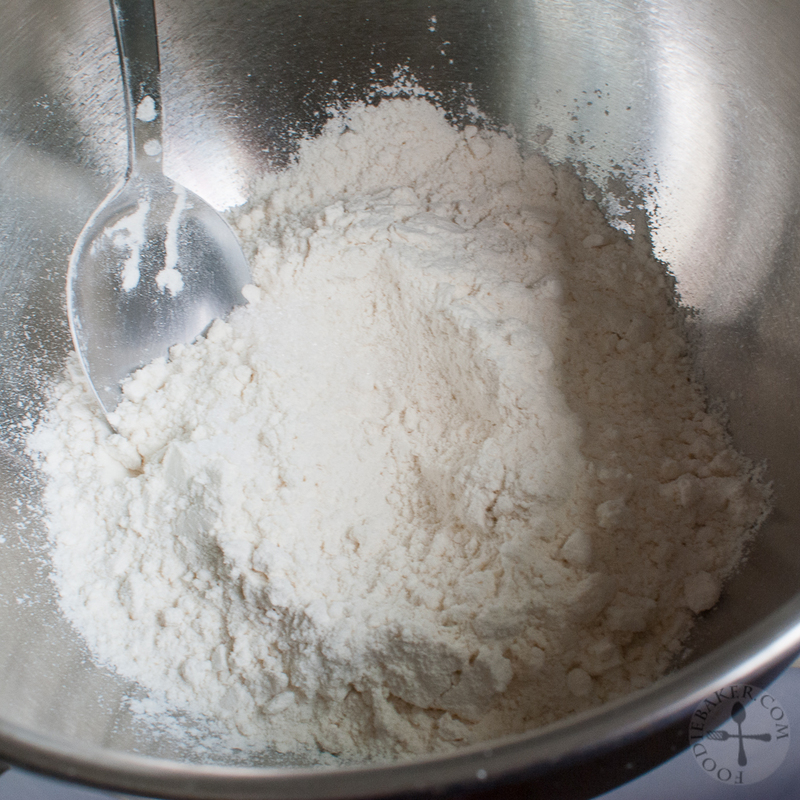 12) Measure flour, salt and sugar in a mixing bowl. 13) Add in hot water. 14) Followed by melted margarine. 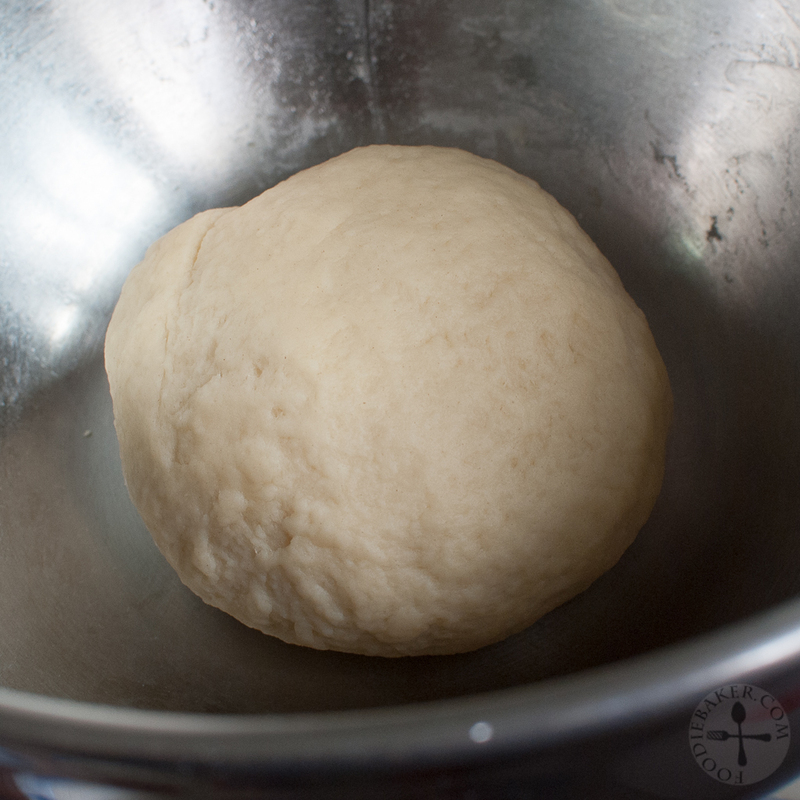 15) Knead into a dough and set aside to rest. 16) Pinch a small portion and flatten it. 17) Scoop some filling in the middle. 18) Fold into half and seal. 19) Crimp the edges decoratively. 20) Deep-fry to golden deliciousness. Pardon the quality of the video as it was taken using my handphone. The crimping uses a pinch-and-fold method – I’ve made the pinching more obvious in the video so that you can tell when and where I am pinching on the puff. It does take some practice – do persevere and you can do it! 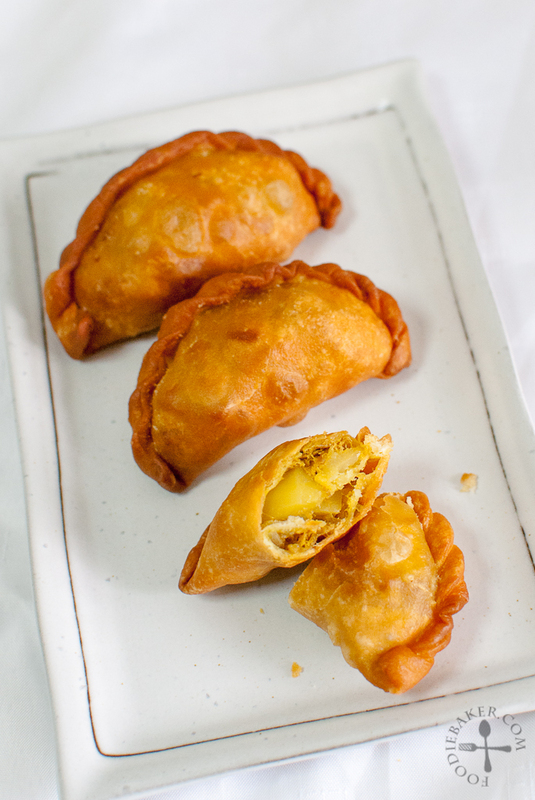 Serve the curry puffs hot/warm – they should be disappearing pretty quickly! Thank you Nuffnang for inviting me to the event and also to Food Playground for teaching us how to make all these lovely and delicious dishes! 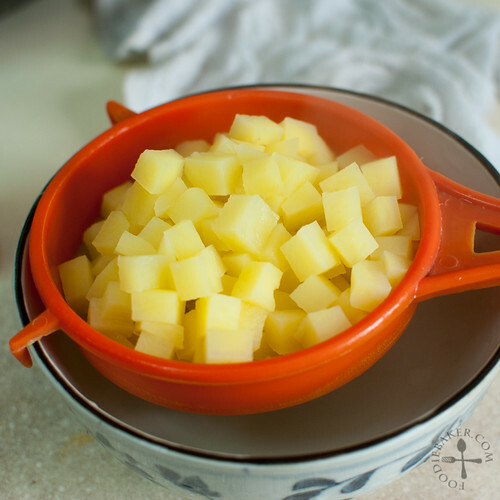 Place the diced potato in a small pot. Cover with water and add in 1 heaping teaspoon salt. 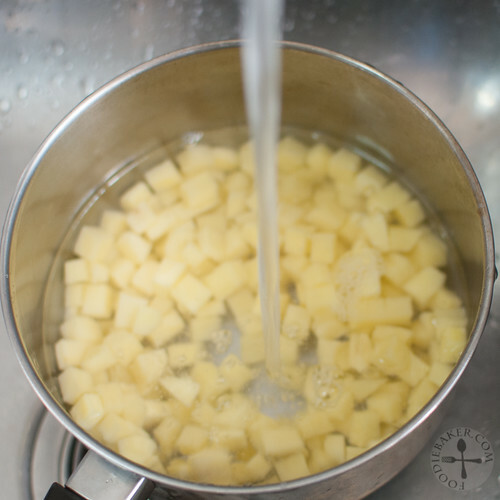 Bring the water to a boil then reduce the heat to low and simmer for a 3 to 5 minutes until a fork can be inserted into the potato easily, without the potato disintegrating. 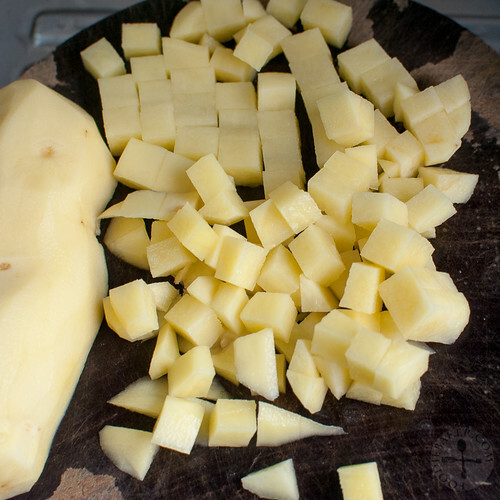 Drain the potato into a colander and set it aside to drain the excess water (no need to rinse the potato). Heat a few tablespoons of oil in a frying pan. 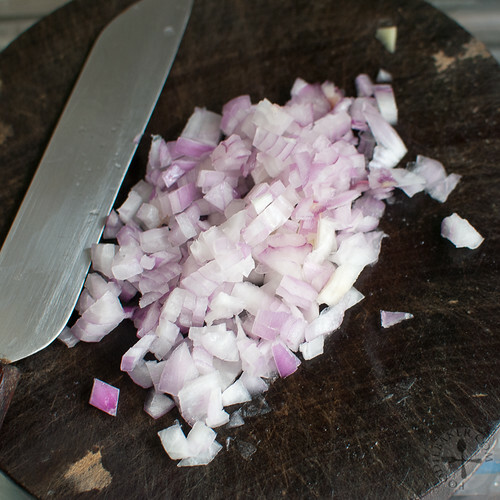 Fry the onion over medium to medium-low heat until onion has became translucent. Add in turmeric and continue frying until fragrant, a couple of minutes more. Take care not to burn the mixture. Drain the oil out of the chilli tuna and remove the chilli. 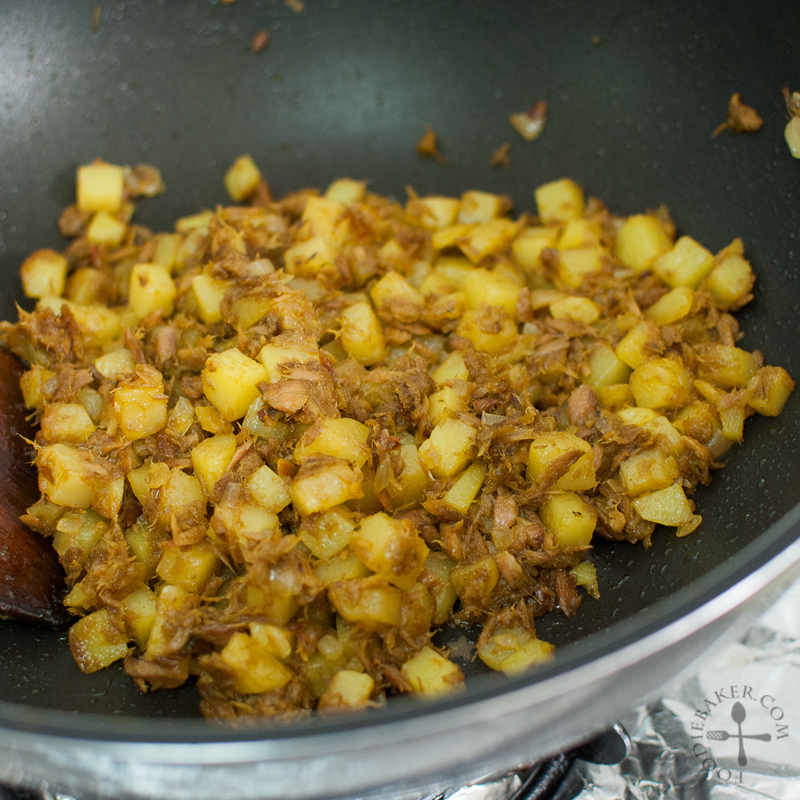 Add into the frying pan together with the potatoes and continue to cook for a few more minutes, adding more oil if necessary. 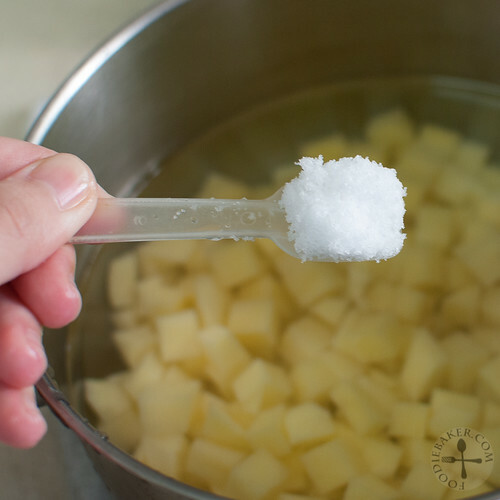 Add in sugar and season with salt to taste. If it's still too spicy, add in more sugar. Remove from heat and set aside to cool. 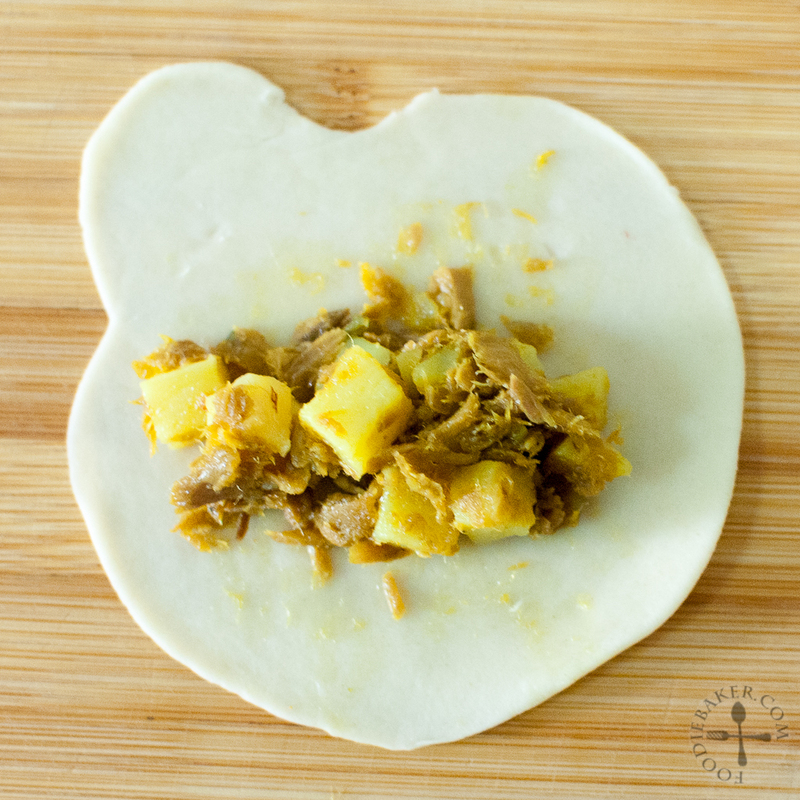 The filling can be made in a day in advance - store in an air-tight container in the refrigerator. Bring to room temperature before using. 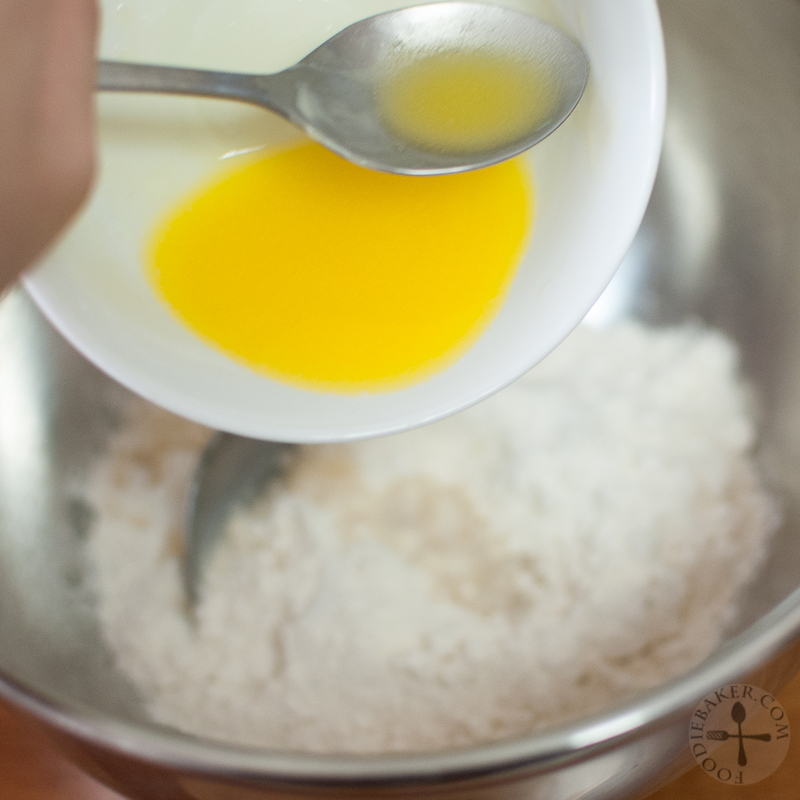 Measure the flour, sugar and salt in a mixing bowl. Add in water and margarine and knead until the mixture is smooth and the dough no longer sticks to your fingers, about 10 minutes. Cover the mixing bowl with a damp kitchen towel and set aside for the dough to rest for 10 minutes. 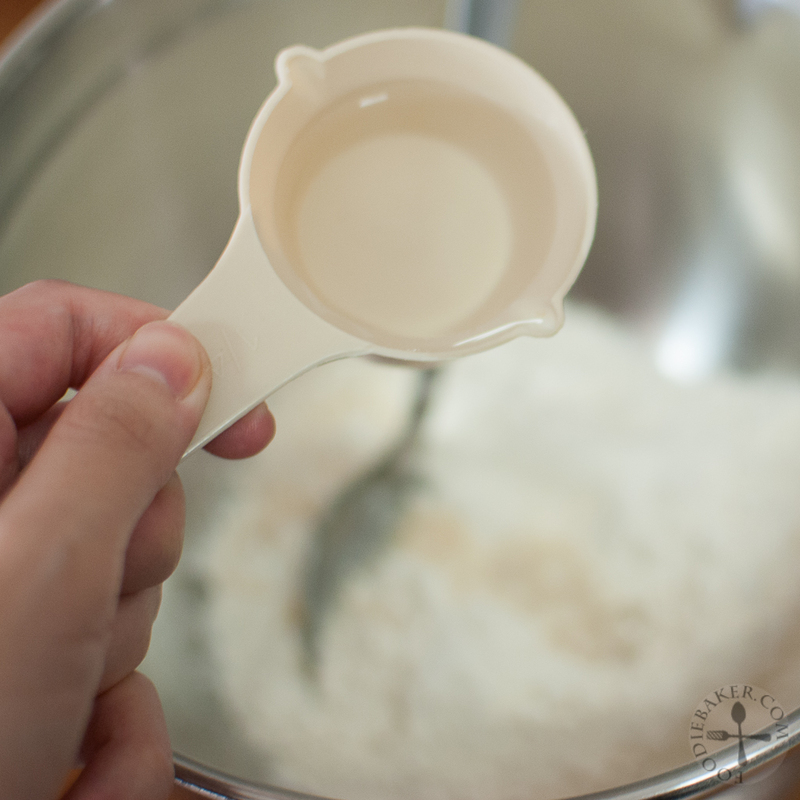 After resting for 10 minutes, the dough should be soft, elastic and very easy to handle. 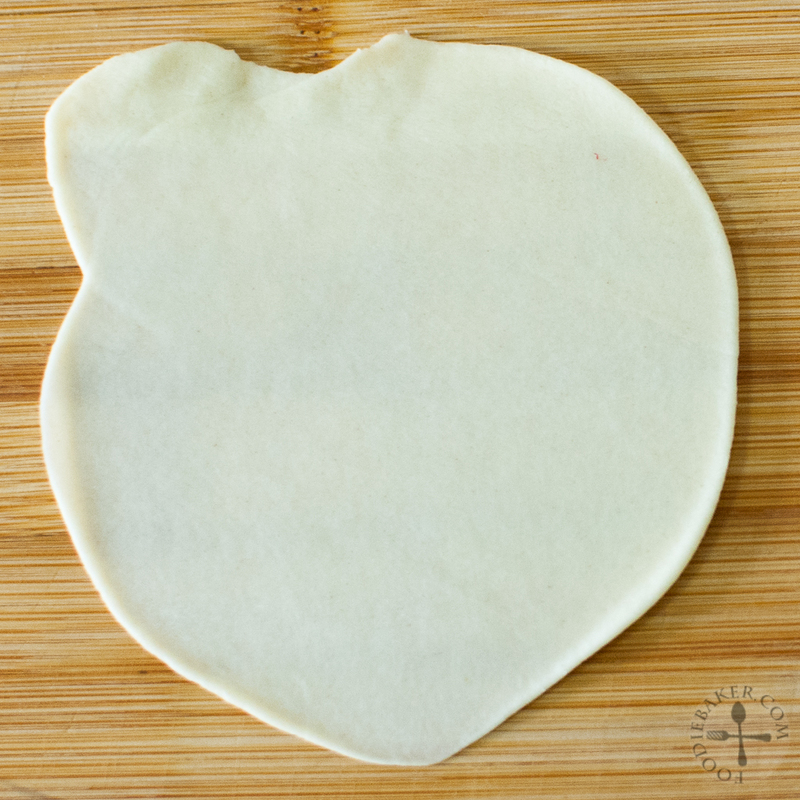 Pinch a small piece of dough, roll it into a ball and flatten into a circle with a rolling pin. Make it as thin as possible without tearing the dough. Scoop the filling into the centre and fold the dough into a semi circle. 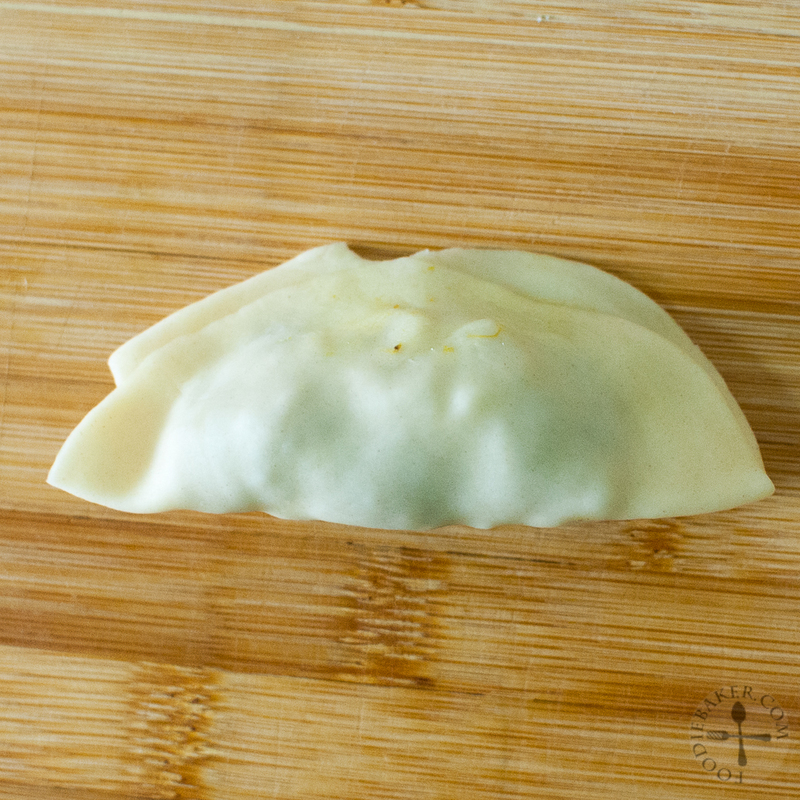 Pinch the edges to seal then crimp the ends to further seal in the filling. Heat oil in a small pot, about 1 to 1.5-inch deep over medium to medium-low heat. 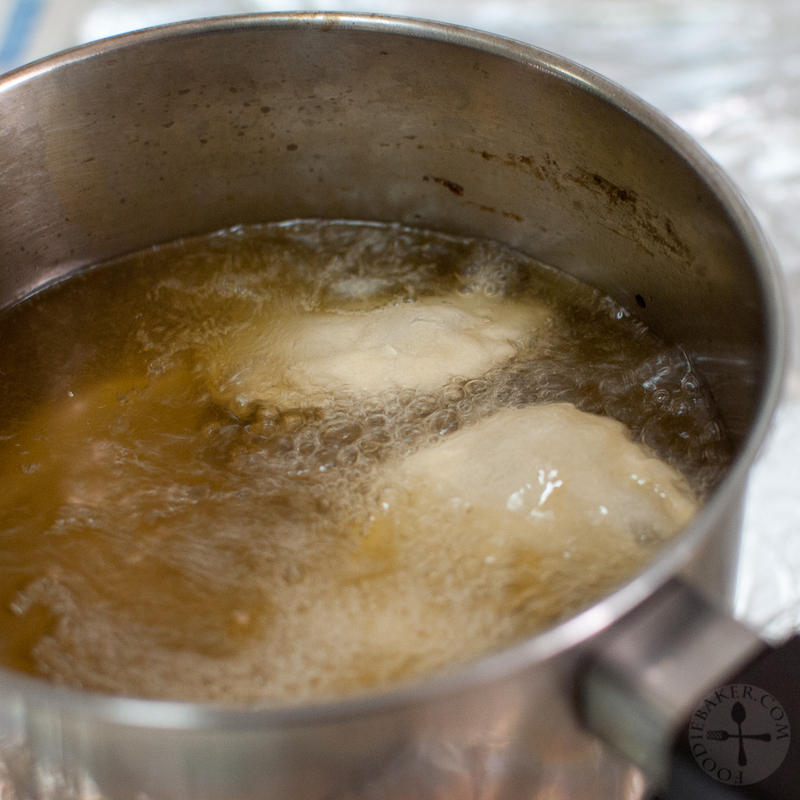 When the oil is hot enough, slide in the puffs gently and deep-fry until the puffs are golden brown in colour. Serve hot or warm. Do not leave the puffs out for too long as the skin will lose its crispiness. 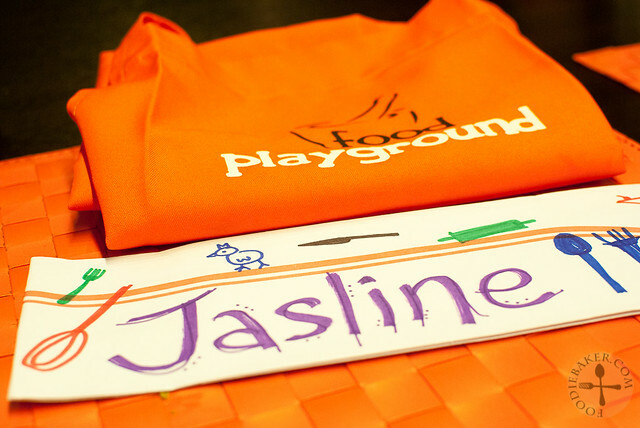 Hi Jasline, lucky you to be able to participate in this event, looks like lots of fun! 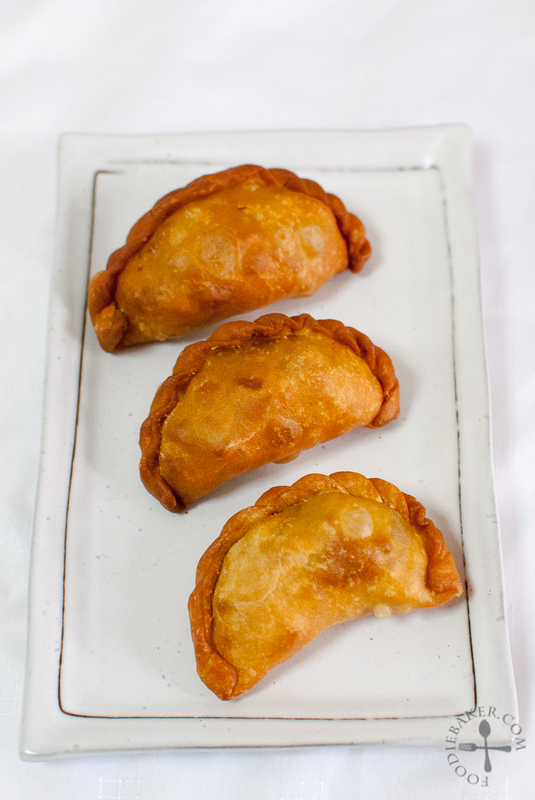 the curry puffs looks crispy and delicious! Oh my lord, I adore curry puffs beyond words. Yours look impeccable (and yes, the crimping is amazing!!! 🙂 ) I can’t wait to try this.